The Holiday season is here! And just to prove it we even got a bit of snow this week. It melted right away but it got us all in the mood to start decorating. The Holiday House Tour is right around the corner and, as participants this year, we had a lot to get done. So Becky, Kaylene, Irena, & I have spent the last four days making bows, decorating trees (yes there will be more than one! ), hanging garlands, etc. We usually decorate with Christmas music (my favorite is an album called "Christmas Kisses") but, the stereo speakers on the fritz, so we had to be satisfied with three little dogs barking, panting and generally acting nuts. If you've met the "Three Stooges of the Gaslight Inn" you know that this is standard operating procedure. And to combat the doggie breath we have been relying on our diffuser of Frasir Fir from our friends at True Friends Boutique . Those ladies really know their stuff and always have yummy smelling things available (along with all the rest of the gorgeous little gifts in their shop!). So, we're almost done now and ready to start making our chicken salad. Because the Holiday House Tour is the Holiday House Tour & Tasting and each location on the tour will have a bite from their contribution to the Inns of the Gettysburg Area Cookbook. Our's is Becky's Curry Chicken Salad. If you want to try some of the chicken salad and all of the other goodies on offer at the different House Tour locations, join us on December 8th! You can buy tickets ahead of time for $10 each or at the door for $12. And we will have a special little surprise for all of you folks who come to tour the Gaslight Inn (and I'm not telling what it is, you'll just have to come and see!). Also, if you are a guest of The Gaslight Inn, even if you are just staying for one night, you get two tickets to the tour on the house!! For more info on the House Tour you can call us at 800.914.5698 or visit the Inns of the Gettysburg Area . The Friday before the House Tour, the 7th, is First Friday in Gettysburg. It would be a perfect night to have a last little get-away before the holidays kick in to high gear. Come and stay for a night at the Gaslight, go to dinner at the Blue Parrot Bistro , the Pub and Restaurant , McClellan's Tavern , the Dobbin House , or any of your other favorite restaurants in town and then take a walk around town and get some last minute shopping in at all of the First Friday participants' shops. This First Friday is also the Cookie Walk in which local shop keepers will have cookie samples and recipes for everyone who is out and about. Then go back to the Gaslight and warm up in front of the fire with nice glass of D'Vine or Entwine'd from Adam's County Winery. The next morning, enjoy one of our handcrafted breakfasts and head out to the Visitor's Center where, with you regular admission fee, you can see a special installation by world famous photographer Annie Leibovitz. Finish out your get-away with your two complimentary house tour tickets and tour historic Gettysburg Area homes from noon to 5pm. Sign me up!! Finally, don't forget that a gift certificate from the Gaslight Inn is a great stocking stuffer and a super last-minute idea. We usually email our gift certificates (unless a guest would like it mailed out in the post, which we can do no problem!) so you can have your gift in your hands in a matter of minutes! If you would like any additional information about any of the topics covered in this blog, please contact Elizabeth or Becky at The Gaslight Inn . Every November, to mark President Lincoln’s legacy made in Gettysburg, the town welcomes thousands of people from around the world for “Dedication Day,” an event that this year features a keynote speech from famous film director Steven Spielberg. Mr. Spielberg’s visit on Nov. 19th coincides with the much-anticipated release of “Lincoln,” starring Daniel Day-Lewis and Sally Field, opening just days before the Dedication Day ceremony. The day will begin at 9:30 a.m. with a wreath-laying at the Soldiers’ National Monument in the National Cemetery. The Dedication Day ceremony will begin at 10 a.m. at the rostrum, where Spielberg will deliver the keynote speech, followed by the recital of the Gettysburg Address by Lincoln portrayer, James Getty. A naturalization ceremony for 16 citizenship candidates will conclude the Dedication Day ceremony. 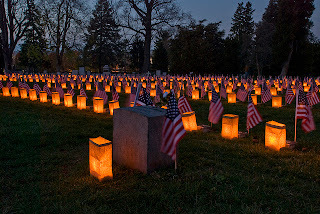 Join us on Sunday night and in the morning make your way to the National Cemetery for the dedication at 10 a.m. This is a very moving event for all. Thanksgiving is next week and The Gaslight Inn is celebrating by offering Thanksgiving dinner to couples who stay with us for 2 nights. Check our website for details at www.thegaslightinn.com. I want to share with you a few happenings in Gettysburg I thought interesting and which might catch your attention too. A Walk With Lincoln offered by the Town Guides. This tour follows the footsteps of President Abraham Lincoln during his November 1863 visit and relates the personal stories of his visit. This is a very special tour and is given every Saturday through November 19, 2012 at 1 p.m. from the Gettysburg Hotel. The tour is 90 minutes. A Civil War Christmas at the Shriver House. The Shriver House Museum offers a candlelight tour every holiday season on Saturdays from November 24th to December 15th. Reservations are required for the 5-7 p.m. Candlelight tour. The Shriver House phone number is 717-337-2800. This is a wonderful experience that will give you the feel of Christmas in the 1860's and put you in the mood for the holidays. Mid-Winter Talks at Gettysburg National Military Park: The War in 1863. Join a Park Ranger for a free indoor lecture on topics related to "The Civil War in 1863." This series of free lectures takes place in the Visitor Center Theater. The lectures are offered most Saturday and Sunday afternoons from January through March 2013. This is a 150th Event. For times the lecture is given, call the National Park Visitor Center @ 717-334-1124 ext. 8023. Finally, I want to call your attention to an exhibit of photographer, Annie Leibovitz's Pilgrimage project featuring images of significant historic American sites. The exhibit features more than 70 photographs, including 2 images from Gettysburg. The exhibit can be found at the Gettysburg National Military Park and Visitor Center from October 25th through January 20, 2013. Innkeeper Annual Civil War Ball. January 26/27 The Inns of the Gettysburg area will hold their Annual Civil War Ball in the Grand Ballroom of the Gettysburg Hotel. Dancing lessons are provided Saturday morning and then the Ball begins in the evening with dinner and the Grand Prominade and Ball. Call The Gaslight Inn @ 717-337-9100 for details. We filled the bathtubs with water, filled the gas tank in our cars, sandbagged the machines in the basement, stored up the non-perishables, etc, etc. and waited. Voila! Nothing awful happened. We had plenty of wind and rain but no flooding in the basement at the Inn - I know it is because we put those sandbags down there! Our trees withstood the pounding and the remaining flowers didn't even break up. We are all very grateful. Our thoughts are with the folks whose lives have been changed forever and hope and pray their situations will mend as quickly as possible. Veterans Day, November 11th is coming quickly and we are offering a FREE night on the 11th for any veteran who stays with us for 2 nights. We are grateful to all the service men and women who work so hard and give up so much on behalf of our country and citizens. Call the Inn @ 717-337-9100. Innkeeper Annual Civil War Ball. January 27, 2013, The Inns of the Gettysburg area will hold their Annual Civil War Ball in the Grand Ballroom of the Gettysburg Hotel. Dancing lessons are provided Saturday morning and then the Ball begins in the evening with dinner and afterward, the Grand Promenade and Ball. Call The Gaslight Inn @ 717-337-9100 for details. Until the next time, Mike, Elizabeth, Toby, Oliver, Gideon and I await your return. SPARKLING AFTERNOON TEA WITH GENERAL & MRS. ULYSSES S. GRANT - Oct. 27th, 2:30-4 p.m. in the parlors at The Gaslight Inn. Cost is $20/person, reservations and deposit are required. Children 15 and older are welcome. Please call the Inn to make your reservation @ 800-914-5698 or 717-337-9100. This event is open to the public and our guests. Reservations are limited. A selection of finger sandwiches, sweet and savory pastries, scones with preserves and clotted cream, selection of teas and, compliments of the Inn, a glass of sparkling wine or sparkling cider. The fireplaces are on at The Gaslight Inn, there’s a nip in the air and planning for the Inns of The Gettysburg Area Christmas House Tour is just about complete. The Inns of the Gettysburg Area will host its 16th Annual Holiday House Tour and Tasting on Saturday, December 8, 2012 from 12 noon to 5 PM. The various historic properties included in the tour are located in Gettysburg, the surrounding area and the quaint town of New Oxford. Each structure is steeped in local history and has a story to tell, whether it be tied to the Civil War and the Battle of Gettysburg, or to colonial times during our nation's birth. These properties have been painstakingly restored to carry on their unique histories. The proprietors of each stop along the tour will open their doors for the day to share the rich history and charm as well as their unique holiday decorations. Many visitors take away holiday decorating ideas to be used in their own homes. Each location will offer a tasting of a special edible treat. Enjoy both savory and sweet items prepared by your hosts. Whether it is a family recipe or a new creation, they are always pleasing to the palate. Each recipe featured is also included in the Inns of the Gettysburg Area Cookbook available for purchase on the day of the tour. In addition to the food, you will also have the opportunity to try several wines created by Adams County Winery. Wines will be paired with the various dishes. Adams County winery offers a wide selection of wines using not only their harvested grapes but also locally grown fruits. They are also the official winery featuring wines for the 150th Anniversary of the Battle of Gettysburg. So please join us for this special event. The tickets are $10/person and can be purchased by visiting www.gettysburgbedandbreakfast.com or by calling the James Gettys Hotel at 717-337-1334. Tickets will be sold on the day of the tour at any of the participating properties for $12. It has been too long since my last blog. I promise (with Elizabeth's help) to keep you updated in a more timely way. Let me begin by saying today is graduation at Gettysburg College and really the beginning of the busy season in Gettysburg. The Gettysburg Festival will begin June 9th with Blues, Beer & BBQ featuring Shemekia Copeland and conclude with Red Molly on June 16th at The Majestic Theater and June 17th A Spiritual Tribute to America's Past featuring Cheryse McLeon Lewis. It will be a fun-filled 2 week! To see all that is planned visit this Festival link www.gettysburgfestival.org/. After the Festival the 149th Annual Commemoration of the Battle of Gettysburg will begin July 6th through July 8th -schedules of events can be found at: http://www.gettysburgreenactment.com/. Spend an afternoon exploring ten lush gardens throughout the Gettysburg area. Each garden has its own rich appeal - no two places look quite the same. There are flower-filled gardens, formal and informal, large and small, all bursting into riots of color and overloading the senses with fragrant smells and sights. June 10th, 1-5 p.m. is the date and time. Make reservations now and join in discovering the beauty of the Gettysburg area: it makes residents never want to leave, and it leaves visitors wishing they didn't have to! Tickets are $10 and can be purchased by phoning 717-337-3423 or by phoning the Inn at 717-337-9100. Proceeds benefit: Adams County Land Conservancy. The Inn hosted our 2nd Sparkling Afternoon Tea and Fashion show with General & Mrs. Ulysses Grant on Saturday, April 21st and it was even better than the first! As you can see below, Mrs. Grant is demonstrating the use of a corset and hoop to one of our more masculine guests! General Grant is sharing the story of their courtship and all that was expected of a young couple in that time period. Our next Sparkling Afternoon Tea and Fashion show will be May 26th and we are hoping for beautiful weather so we can enjoy the gardens and patio.